Pinch, punch, first day of the month!! (Kick and a flick for being so quick!!) Do you remember doing this at school? I swear there were loads of “clever responses” like that, and they were all very violent thinking about it.. Anyway – can you believe it’s March already?! March is when the cobwebs of the New Year have finally blown away. I have now fully recovered from the holiday season, my new healthy living routine is no longer a new year whim and officially a real thing and the time for my ‘this-year-I’m-going-to’s is pretty much now or never! 2014 is well and truly here. But what has been brightening my grey days and equally greyer skin since January 1st? This fab CC cream from Seventeen! HIYA. One of the most frequent questions I get asked is “What’s your favourite BB cream” to use? 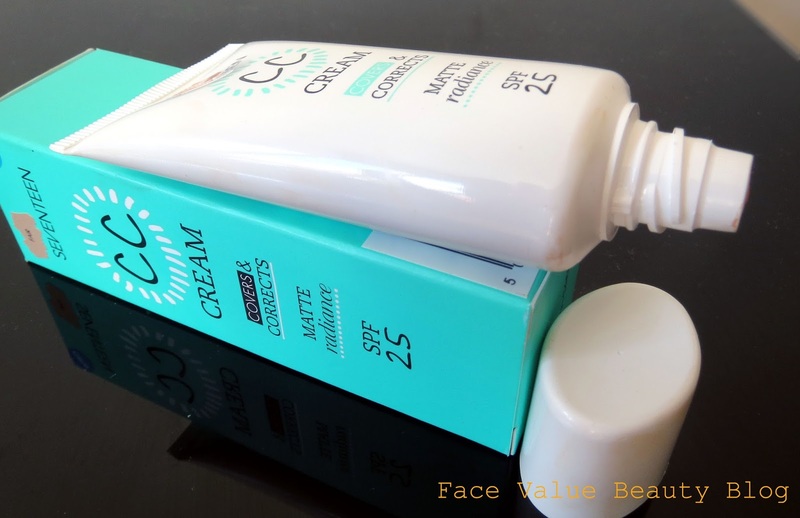 It used to be the Garnier Matte Miracle Skin for Combination/Oily – but then I started using this Seventeen CC Cream and I was completely blown over!! I’ll be honest, BB creams are neither here nor there for me – not quite as much coverage as a foundation, BB creams are effectively a tinted moisturiser with an SPF. I’m usually an all-or-nothing kinda gal. I wear BB creams on lazy sunday mornings, after a rare trip to the gym and on (even rarer) good skin days. What’s the difference between BB and CC? A CC cream stands for a variety of names – generally something like colour control, colour corrector or complexion corrector. The actual properties of a BB and CC cream will vary with brand, but in general, a CC cream is a BB cream but with added complexion enhancers. Complexion enhancers? I’m talking ingredients which soothe redness, colour pigments which counteract sallowness and formulations which give a better ‘finish’ on the skin. From my experience – BB creams have been slightly more moisturising, but CC creams make my skin look much better. What’s so good about this one? Like I said, I’ve not really been fussed before about alphabet creams. Give me a foundation-finish any day! But then I tried this Seventeen CC cream which actually gives pretty decent coverage, and with a gorgeous matte-yet-radiant finish. This Seventeen CC Cream has a “matte-radiance” finish which basically looks glowy but without looking oily. IDEAL!! It’s really hard to explain “matte radiance” so lets just take a HUGE CLOSE-UP SELFIE. This is me, with my Seventeen CC Cream in Fair. No highlighting powder or finishing powder – just blush. You can still see my freckles underneath it but my skin looks even, with a subtle radiance that’s not shiny. Oui Oui? It wasn’t all roses though. I’ll be honest – when I first got this, I didn’t really like it – I thought it was too pink toned, and not the right colour. Take a look at my hand below, it doesn’t look quite right, right? But never judge on first appearances! I realised that, once the CC Cream has oxidised and reacted with my skin – the colour made like Goldillocks and became juuuuuuuuuuust right. I now wear this INSTEAD of foundation on most days. Seriously – me? A ‘more is more’ kinda gal?? Yup, I’ve ditched my foundation and wear this CC cream instead. Obviously foundation comes back onto the court for long days, going out-out and the like, but this CC cream gives me the coverage and finish I need for a ‘normal’ day at work. BEST BITS: This CC Cream is SPF25, feels comfortable on my skin and provides some decent coverage. I even use it under my eyes as a concealer sometimes! Oh yeah, and it’s only £6.99 – a lot cheaper than my foundation! Definitely re-purchasing. BOO BOOS: It’s a huge shame that it only comes in two shades. It’s definitely crossed out a huge part of the market with that. At the same time, I’m wearing Fair which I thought was terribly wrong for me, but I definitely recommend testing it on your skin, and coming back to a couple minutes later! So what do you think? Is matte-radiance the new dewy? And what do you think BB and CC stand for?? What were your responses for Pinch Punch at school??! I remember something about poking in the eye, I must have been a horrible little child…! ** Thank you to Boots for sending me this CC cream!